We had a wonderful evening of whisky discovery at the Scotch Malt Whisky Society, located in an impressive four–storey Georgian building on Queen St (Edinburgh). The evening comprised of a 3 dram private whisky tasting followed by a meal. The whiskies in the SMWS are a fabulous journey of discovery, all bottled in an iconic Society green bottle. 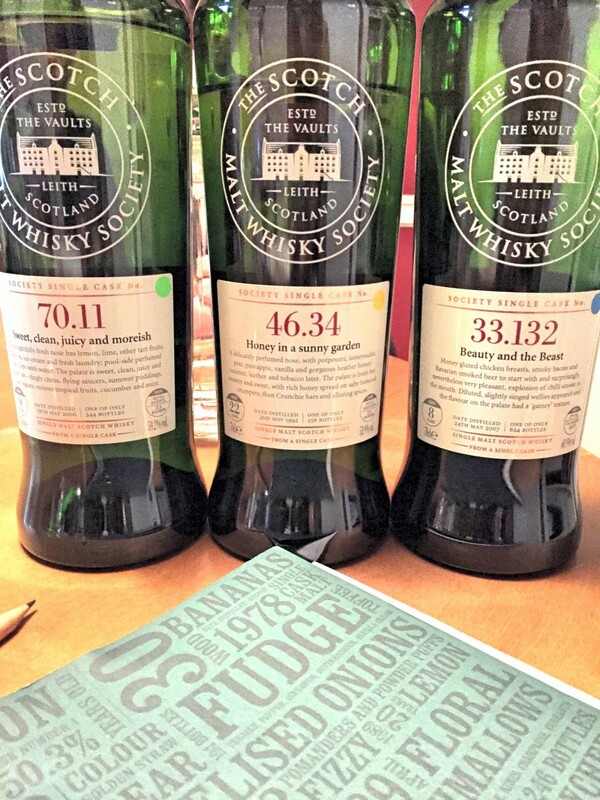 The SMWS sources rare single malt, single cask whiskies for the uncompromising noses of their expert tasting panel to deem worthy to be bottled by SMWS. You will then only find these bottles from the SMWS themselves (in their venues, online & international partner venues), with 27000 members worldwide accessing special member prices both online and in the venues themselves. 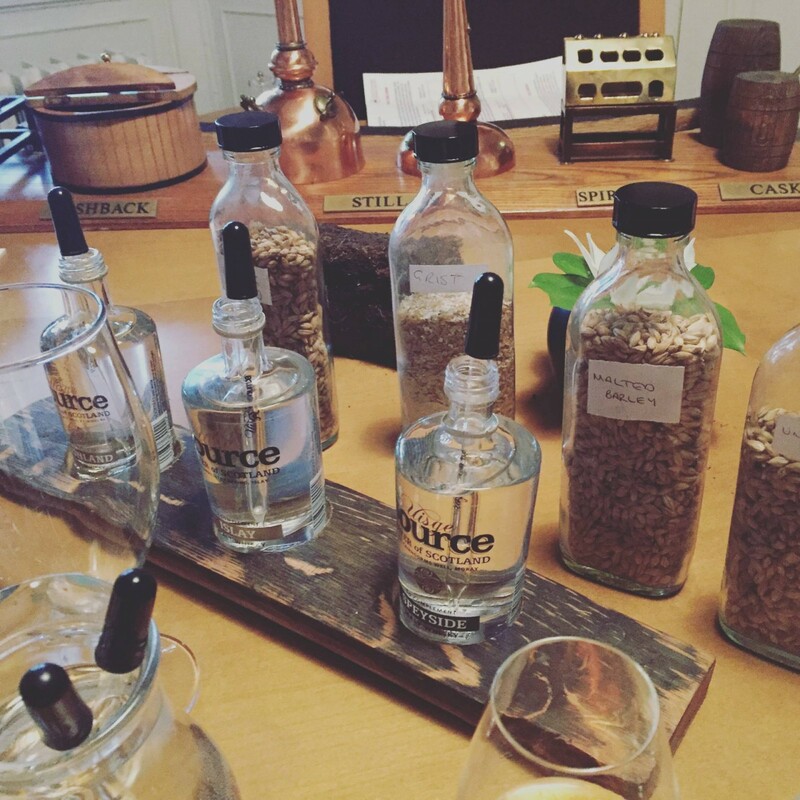 The bottles themselves are all an iconic green bottle with crafted titles and tasting notes from the expert panel. My favourite from the evening was Honey in a sunny garden – ‘lively but creamy and sweet with rich honey spread on salty buttered crumpets’. Each cask they source creates a certain number of bottles; ‘one of only 256 bottles’, which means once they are gone, they are truly gone and they will never have that exact expression of whisky again, which makes each of the SMWS bottles truly unique. The tongue in cheek aspect of the titles & tasting notes makes discovering the whiskies a fun experience, especially for myself who is by no means a whisky aficionado. 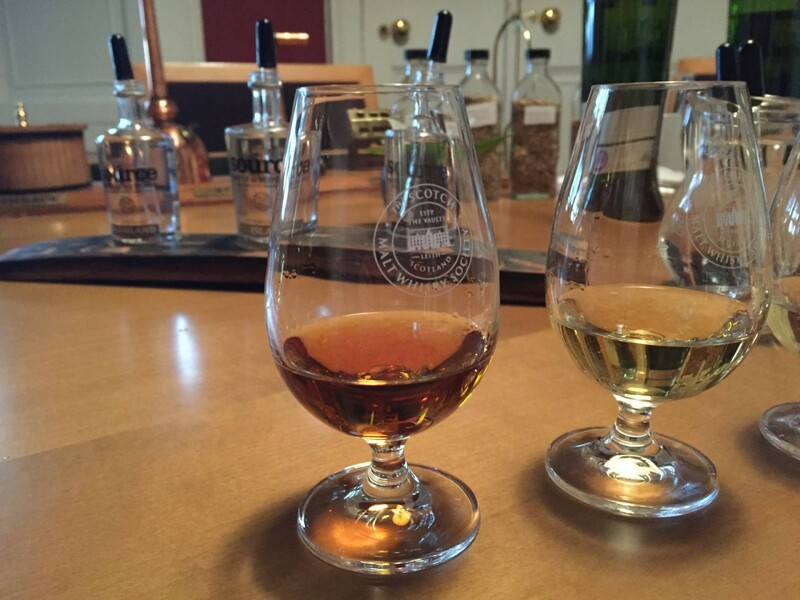 Open to members and non–memberalike, the SMWS on Queen St (other SMWS venues may be members only) provides a beautiful, relaxed environment to either have a coffee in the morning or discover some rare cask strength whiskies in the evening with passionate whisky ambassadors on hand to help you decide. There was no air of arrogance or pompous whatsoever, the whisky ambassadors seemed truly happy to help us discover our whisky tastes, while relaxing in a friendly ambience. If you have a partner or a friend that enjoys a dram, I would absolutely recommend taking them along for the experience. Or better yet, purchase a membership for them as a gift. Priced at £122, which will give them access to special discount rates in the online shop and on drams in the venues, and exclusive access to members only rooms in Leith, Edinburgh & London. The award-winning quarterly magazine Unfiltered delivered to their home. A Society welcome pack including three limited-release 10cl bottles and a £10 voucher, as well as the Society journal, membership card and pin badge.